Is Ethiopia Violating UN Sanctions against North Korea: New Evidence Uncovered – Satenaw Ethioopian News & Breaking News: Your right to know! Since the 1970s, Ethiopia has been in the company of North Korea’s most loyal military customers. Amongst other things, Pyongyang has been a source of munitions, armored personnel carriers, tanks and tank parts, artillery and rocket fuel. In addition to these forms of assistance, North Korea has helped Ethiopia construct, operate and upgrade two weapons factory complexes—today known as the Gafat Armament Industry and Homicho Ammunition Industry. From Ethiopia’s perspective, contracting to North Korea for the initial supply of weapons production technology was a means of reducing long-term dependence on foreign military suppliers. (More comically, according to the Ethiopian Chief of Defence Staff, North Korea’s help in this regard also allows Ethiopia to meet its peacekeeping obligations). Yet in practice, the effects of Ethiopia’s investment have been mixed. On the one hand, it has indeed learned to build certain varieties of small arms and munitions domestically, and now even exports its wares to countries like Sudan. On the other hand, it does not seem to have been able to easily or entirely eschew North Korean assistance, and may still depend upon their goods and services. Securing North Korean help to establish and operate arms factories in the late 1980s was neither politically poisonous, nor outright illegal, in the way that it is today. It was first with UN Security Council Resolution 1874 (2009) that a clear prohibition against purchasing “all arms and related materiel, as well as…technical training, advice, services or assistance related to the provision, manufacture, maintenance or use of such arms or materiel” from North Korea was articulated. For this reason, the UN Panel of Experts (established pursuant to Resolution 1874) has taken interest in signs of recent, continuing involvement of DPRK entities in the operations of the Homicho Ammunition Industry. And it is for the same reason that further investigation is needed into potential North Korean links with the second small arms plant in Ethiopia—the Gafat Armament Industry—about which new information, dating to the period shortly before the passage of UN Security Council Resolution 1874, has come to light. Ethiopia is neither the first, nor the only country to have lusted after an indigenous arms manufacturing capability and paid Pyongyang to help. Such facilities are peppered across the globe, in countries as diverse as Madagascar, Syria, Libya, Iran and possibly Uganda. North Korean-designed ballistic missile production lines throughout the Middle East are the most well-known examples of Pyongyang’s efforts to bolster the indigenous capacity of foreign friends. Factories producing small arms and ammunition, light weapons and some heavier conventional systems are less renowned, but are equally relevant to the implementation of the current sanctions regime against the DPRK. For North Korea, the design and manufacture of arms factories (or individual arms production lines) in foreign countries remains an evident market opportunity. Most countries with export-oriented military industrial complexes are reluctant to assist another country in developing a level of indigenous capability that eventually reduces the customer’s dependency on foreign supply. However, in this respect as in many others, North Korea is not ‘most countries.’ It has proven more than willing to earn profit in the short-term by helping foreign friends learn to make their own weapons, even if that means losing revenue in the future. For example, in a 2004 meeting between the Nigerian Vice President and Yang Hyong Sop—the Vice President of the Presidium of the Supreme People’s Assembly—the latter proposed that North Korea provide Nigeria with ammunition production assistance. The first of two Ethiopian defence industry sites believed to have ties to North Korea—the Homicho Ammunition Industry—was established in 1987 as ‘Project 130’ and subsumed under the parastatal Metals and Engineering Corporation (METEC) in 2010. Based near Ambo, its production lines include: small, medium and heavy ammunition; tank shells, mortar bombs and grenades; and 120mm ‘Katyusha’ rockets. The Homicho complex is the largest North Korean-assisted site. Initially, Pyongyang’s involvement probably centered on the design and establishment of production lines for munitions. These forms of assistance apparently continued through to at least late 2007, and included help manufacturing rocket-propelled grenades and truck-mounted multiple rocket launchers. Around the same time, it also became clear that Ethiopia was suffering from dependency on North Korean spare parts and machinery for the factory. Because of their (presumably antique) North Korean design heritage, Homicho’s production lines use specific parts and machines, for which there are apparently few cost-effective available sources outside of Pyongyang. Sunk costs in those facilities would have similarly made re-tooling a pricey affair. Homicho’s centrality to the Ethiopia-North Korea relationship has made it a subject of intense interest and scrutiny. Until at least 2009, and likely thereafter, the US Embassy in Addis Ababa continually exerted pressure on senior Ethiopian officials to sever related contracts with North Korea, much like the US had previously done with governments in Libya and Yemen. In November 2008, it appeared that this pressure might finally yield greater cooperation by the Ethiopian Ministry of Defense, which agreed to let the US Ambassador and a small team into Homicho the following month. Only a few days before the visit was scheduled to take place, the Defence Minister resigned and US access was promptly suspended. The Embassy was told that ‘there would be no problem with the visit if Ethiopia were to get technology or financial assistance from it.’ It is unclear whether access was successfully facilitated thereafter, though the initial offer suggests that the Ethiopian government may at least be open to greater transparency. In 2014, the UN Panel of Experts spotted public evidence of a possible continuing link between North Korea and the Homicho Ammunition Industry—by then controlled by METEC. Homicho’s official company profile listed the ‘Korea Mineral Trading General Corporation’ as one of its primary suppliers: an entity that does not appear in South Korean company registries. Given the factory’s history, it is therefore reasonable to assume that the company is North Korean. Supporting this conclusion is the fact that reference to the Korea Mineral Trading General Corporation was swiftly removed from the Homicho website following the publication of the UN Panel’s report (though they apparently forgot to sanitize the accompanying PDF brochure). The second site known to have been assisted by North Korea in the past is the Gafat Armament Engineering Industry, located near Debre Zeit. Gafat was opened in 1989, two years after the Homicho plant. While originally built to manufacture AK-47s and light machine guns, in 2002 it was incorporated into METEC (which also controls Homicho) and was upgraded to produce ‘40mm grenade launchers and other automatic weapons attached on armored vehicles and helicopters’ as well as ‘heavy artillery and howitzers.’ Around this time Gafat’s remit was also allegedly expanded to include armament maintenance. In addition to the confirmation of early North Korean involvement in Gafat offered in leaked US cables, a glance at marketing material for Gafat highlights the evident overlap between the weapons systems North Korea is able to indigenously produce, and those that Gafat now manufactures. Many of the systems shown above are ones that North Korea is able to produce. Of course, it is worth noting that North Korea originally received or reverse-engineered many of these same systems from the Soviet Union or China, and therefore the Gafat designs bear resemblance to weapons produced by those countries as well. The twin-barreled anti-aircraft gun that is depicted (originally a Soviet design), or twelve-barrel multiple rocket launcher (originally a Chinese design) are examples. Worthy of note is the tear gas gun shown in the top right of the Gafat brochure. A gun of strikingly similar design was photographed in the hands of North Korea’s People’s Security Minister while on a 2013 visit to Uganda—a country also suspected of having received North Korean assistance in indigenous weapons production. While not conclusive evidence, a commonality between many of the designs featured in Gafat’s marketing material is their familiarity to North Korea’s own defense industrial complex. A gun of strikingly similar design to one shown on the Gafat brochure was photographed in the hands of North Korea’s People’s Security Minister while on a 2013 visit to Uganda. Photo: AFP. More concrete evidence of North Korean involvement in operations at Gafat dates to late 2007. An industrial engineering study of the complex’s inefficiencies, published by the University of Addis Ababa, speaks of a contract with the ‘Korea Ryong Bong General Corporation,’ active at the time of writing in late 2007, to retool production lines for the AK-47 and AK-103. Records of conversations between General Samora and US officials in 2008 discuss what seems to be the same contract between the governments of Ethiopia and North Korea. Samora insisted, however, that “North Koreans have now finished their work and are leaving” Gafat. The General’s statements regarding the North Korean presence at Homicho and Gafat were frequently contradictory, however. They alternated “between ‘we will continue to source from North Korea’ and ‘we haven’t sourced from North Korea in the past year’ as well as ‘the North Koreans have left’ and ‘some of the North Koreans may still be around.’” It is therefore possible that Pyongyang’s involvement in Gafat and other Ethiopian weapons factories continued beyond 2008. Enquiries into the affiliation of the ‘Korea Ryong Bong General Corporation’ and the nature and duration of its contract with Gafat is therefore necessary. Contradictory statements by Ethiopian officials, as well as fresh suspicions about Gafat’s ties to North Korea, are reasons to continue to ask questions about whether Pyongyang’s involvement in domestic arms production persists. Alleged dependency upon North Korean supply is another. General Samora and other Ethiopian officials have repeatedly affirmed that METEC-run weapons factories are ‘dependent’ upon North Korean spare parts and machines for their production lines, as noted above. Provision of any such spare parts, machines or maintenance services by North Korea would now be sanctioned activity. Even if cooperation has recently ended, modest but growing evidence suggests that sanctions may at some stage have been breached by the Ethiopian government and/or METEC, which controls the two factories in question. The UN Panel of Experts’ recent interest in Homicho speaks to the Panel’s concern that any North Korean link with the site may be in violation of UN Security Council Resolution 1874. Indeed, Homicho’s subsequent, swift sanitization of its publicized suppliers list compounds suspicion that interaction between METEC and Pyongyang is continuing in breach of the current sanctions regime. Furthermore, North Koreans were acknowledged by officials to still be on the ground at the Gafat site only months before Resolution 1874 was passed—as part of a contract between the government-run METEC and the Korea Ryong Bong General Corporation. Temporally, this takes confirmed cooperation too close to sanctions territory for comfort. “Defense Officials Impose Last-Minute Impediments on Arms Inquiry on North Korea,” Embassy Addis Ababa (Ethiopia), 14/01/2008, #08ADDISABABA87. Accessed via Wikileaks on May 27, 2014. 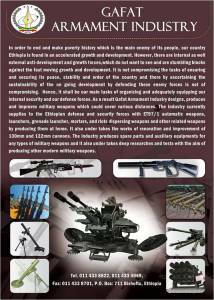 Homicho Ammunition Engineering Industry—A Fact Sheet, Metals and Engineering Corporation,,http://www.metec.gov.et/images/PDF/Homicho%20Ammunition%20Engineering%20Industry.pdf. “North Korea offers Nigeria missile deal,” Washington Times, January 28, 2004,http://www.washingtontimes.com/news/2004/jan/28/20040128-114425-6730r/?page=all. Homicho Ammunition Industry, op cit. “Defense Officials Impose Last-Minute Impediments on Arms Inquiry on North Korea,” op cit. “Report of the Panel of Experts Established Pursuant to Resolution 1874 (2009),” United Nations Security Council, S/2014/147, pp. 35 -36. Homicho Ammunition Engineering Industry—A Fact Sheet, Metals and Engineering Corporation,http://www.metec.gov.et/images/PDF/Homicho%20Ammunition%20Engineering%20Industry.pdf. A search using Wayback Machine reveals the fact that reference to the Korean entity was removed following the UN Panel report. Gafat Armament Industry, Metals and Engineering Corporation,http://www.metec.gov.et/index.php/en/metec-industries/gafat-armament-industry. For an overview of North Korean weapons systems in the 1990s, including photographs or drawings, see the “North Korea Country Handbook,” US Department of Defense, May 1997, http://fas.org/nuke/guide/dprk/nkor.pdf. Andrea Berger, “A Legal Precipice? The DPRK-Uganda Security Relationship,” 38 North, November 13, 2014, http://38north.org/2014/11/aberger111314/. Tewodros Rufael, “Design of Enterprise Resource Planning: Framework and Its Implementation,” Supervised by Dr. Subhash Chandra at the Graduate Studies of Addis Ababa University, November 2007, pp. 8-9.